We are offering Rubber Bellow to our clients. We are engaged in offering a superior range of Rubber Bellows and boots to our clients, which is manufactured from high grade polymers in compliance with industry standards. Our range is used as covers on parts, which are critical and need to be protected from dust. 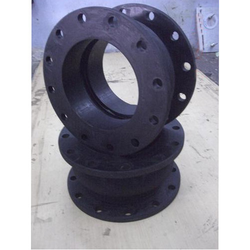 Keeping in mind the diverse requirements of our clients, we are engaged in offering a wide range of Rubber Expansion Bellow. These products are well equipped and ensure long lasting service life. Our products are dimensionally stable and offer hassle-free performance. We are offering these products at reasonable rates. We are the leading manufacturer of all types of bellows used in all types of industries. bellows are used in machine to prevent dust particles, metallic chips, foreign particles to enter into the precision or important part of the machine to avoid damages to! It and give longer life to the machine part to avoid brake down of machine. It also gives better look to the machine. Banking on the skills of our professionals, we are offering a quality tested array of Rubber Bellow. The Rubber Bellow we offer is widely demanded amongst the clients for its hassle free performance and durability. Moreover, offered products find their applications in various industries.